Katherine has worked in Harden Jackson, LLC’s Adoption and Reproductive Law Group since March 2014, first as a law clerk and now as an attorney. She is passionate about helping individuals build families, and has conducted extensive research on international surrogacy. 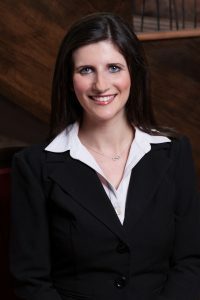 She has authored a publication in the Indiana International and Comparative Law Review titled “Clipping the Stork’s Wings: Commercial Surrogacy Regulation and Its Impact on Fertility Tourism.” Katherine is quadrilingual (English, Russian, Spanish, and French), and particularly enjoys the international aspects of adoption and reproductive law. Katherine focuses her practice on reproductive law, adoption, immigration, and estate planning. Katherine assists intended parents in drafting their gestational surrogacy agreements and establishing their legal parentage, represents surrogates in reviewing their contracts, and drafts sperm, egg, and embryo donation agreements. Katherine also represents adoptive parents and birth mothers, provides estate planning services to reflect new additions to families through surrogacy and adoption, and assists clients with immigration matters such as orphan visa denials and visa applications.